The entire story of CurQlife® is about how many curcuminoids are able to reach the blood. What makes CurQlife® unique and superior is the manufacturing technology and components used to prepare it. Since curcuminoid powder is of low solubility, the powder is reformulated into a proprietary water dispersible liquid formulation by mixing curcuminoid powder with select food’ grade emulsification aids, namely polyethylene glycol 200 (PEG 200) and polysorbate 20. Polysorbate 20 (Tween 20) acts as an emulsifier and improves the solubility of curcuminoids, which are very hydrophobic, by micellar solubilization. PEG (Polyethylene glycol) reduces the interactions between the nanoparticles and enzymes of the digestive fluids and increases the uptake of the drug in the blood stream. PEG also improves the polydispersity index of the nanoparticles (Tobio et. al., Colloids Surf. B Biointerfaces 18, 2000, 315), (Owens et. al., Int. J. Pharm. 307, 2006, 93). The ability of the PEG to protect the coated nanoparticles from metabolic enzymes gives the particles long circulation time. 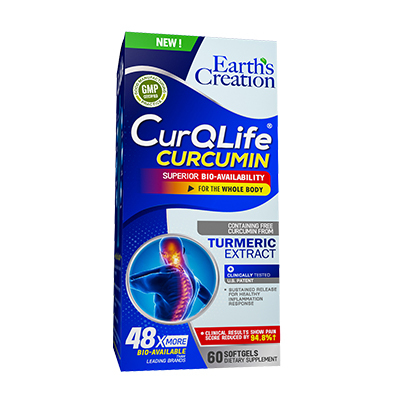 In human trials, CurQlife® showed a 48-fold higher difference in free curcumin in the blood. CurQlife® is the next stage in joint care supplementation. Statistically significant less inflammation and joint stiffness. A third party study was conducted to ensure the quality of our new product CurQLife.The test included males and females from the age of 40-75 with Osteoarthritis symptoms in their knees. Subjects who met the inclusion and exclusion criteria were randomized into the study in 1:1 ratio in CurQlife L (N=20) and Placebo group (N=20). The study was designed for 60 days and consisted of six visits including screening visit, visit 1 (baseline), visit 2, visit 3, visit 4 and visit 5. Subjects were requested to take one capsule of CurQlife L or placebo twice daily after food. The following charts display the results from the study.